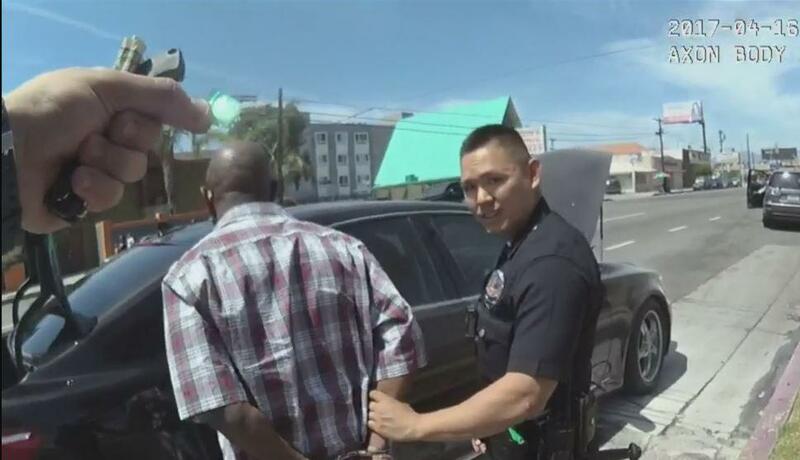 LOS ANGELES -- The Los Angeles Police Department has opened an investigation into allegations that an officer planted drugs on a suspect after CBS Los Angeles showed bodycam footage of the incident contradicts the officer's claims. The segment from investigative reporter David Goldstein aired earlier this week. Footage from 12 body cam videos obtained by Goldstein show what appears to be LAPD Officer Samuel Lee picking up small bag that later tested positive for cocaine and placing it Ronald Shields' wallet. Shields, 52, had been stopped for a hit-and-run in April of this year and was subsequently charged on that felony and possession of cocaine, CBS Los Angeles reports. After the investigation aired, the LAPD said in a statement: "The LAPD takes all allegations of misconduct seriously and, as in all cases, will conduct a thorough investigation." Mayor Eric Garcetti also released a statement, saying the mayor "expects the highest integrity from everyone who wears the badge." Lee and fellow officer identified as "Gaxiola" were called to testify in a pretrial hearing as Shields' attorney challenged evidence to be used at trial. This is the first time bodycam video used in a case has been obtained by the media. Lee is seen searching the suspect. He testified in court, as in the police report, that the cocaine was found in Shields' left front pocket. But the videos shows a different story. In video from another angle, Gaxiola picks up Shields' wallet from the street and shows it to Lee, who points to the suspect as if to say it's his. He then puts it back down, steps to the street, bends over and picks up a small bag with white powder. It eventually tested positive for drugs. Gaxiola goes back onto the sidewalk, picks up the wallet, motions to Lee and appears to put the bag into the wallet. The officer may not have known that the previous 30 seconds are automatically saved without audio after turning on the bodycam. Gaxiola hasn't testified and had nothing to say Thursday. In the video, after he collects the wallet, he brags about it to the other officers. "He has a little bag of narco in here," he says on the video. He says it three times. Lee says the bag of drugs fell out of Shields' pocket. Levine has another theory and believes it proves Gaxiola planted the drugs. "There's a little white square here in his hand," Levine said about one point in the video. "I believe the video shows the drugs were in his right hand and transfers to his left hand." The hearing will continue in December.